Clayton Christensen in his book The Innovator’s Dilemma showed us that the business drivers of our current customers blinds us to emerging but currently unsuitable technology that eventually takes over our market. This has led to a focus on Innovation that looks to be disruptive as its primary goal. And I have come to the conclusion that this has hampered our attempts at Innovation. We have set the bar too high. And this isn’t what Innovation was about. Just a way of looking at a specific type of Innovation. OK, I wrote the above as part of my review of of Frank Connolly of Think Quick and his approach to Practical Innovation. So Google knows I’m plagiarising myself. But here is where the relevance kicks in. In my article on Light Cameras I covered a new concept in camera’s developed by Dr Rajiv Laroia who co-founded Light. The Light L16 is a new camera concept using multiple lenses and cameras to fuse a composite image given focal ranges and exposure ranges not possible in conventional cameras. An excellent example of disrupting innovation. and also an excellent example of The Innovator’s Dilemma. Announced in 2016 and expected to be ready that year it was not shipping until mid 2017. Why? Because it is hard to do and the ASIC development was late and the core idea of doing the fusion inside the camera in real time is proving harder than expected and data transfers are too slow (they are transferring 16 cameras worth of data for 1 picture) and focus isn’t good enough and low light performance also isn’t good enough and did I mention it is hard! I’m still impressed with the idea. But like all true disruptions it isn’t good enough when it first launches. Look at the modern DSLR. It shows you the picture you will take, it is seconds from taking the picture to being able to look at it. Focus is multi zone and you can decide how sharp or soft you want it and where. Auto exposure can handle high backlight shots and a wide range of light conditions. Fantastic. And decade in the making. The Light L16 isn’t surpassing it yet but you can see the trajectory and the camera of the future shows its potential now in what they are doing. I’m also impressed with the open approach they are taking with customers. In a recent article Dr Rajiv Laroia explained why the Light L16 was delayed, how they were supporting their customers and what the plan for addressing the issues is. An excellent example of Collaboration with their customers rather than bunkering down defensively. This still looks like it will be a success. It will just take longer than any of us expected. IEEE, the Institute of Electrical and Electronic Engineers, is the largest professional engineering body in the world and has a world wide focus. I am a Senior Member and have always found it worthwhile. In the days before the Internet was as useful as it is now, they were the best source of regular and up to date news about technology advances and what was happening in the world of technology. A great example of this is the IEEE Collabratec platform. This fosters Collaboration over a very wide range of topics including ethics. I’m a regular contributor and was very pleased to see the figures for the its use in 2017. Check out the graphic below. Click on it to get a larger version that will be easier to read. So a very good year for Collaboration. Google’s Project Loon which used high altitude balloons. But there are also Satellite Internet contenders. Theses were nicely covered by recent blogs at CIS 471 and I’ve picked out some essential bits of information. The image above shows Boeing‘s plans to cover the earth with 2956 satellites. You can read more at Boeing’s satellite Internet project. The next company is SpaceX who are also involved in rocket and satellite design. They are looking at 4425 satellites in low earth orbit. SpaceX believe that they can speed up Internet Back Haul by reducing the number of router hops required. The example above shows 5 space hops (including up and down) replacing 14 conventional hops. You can read more at SpaceX satellite Internet project status update. And OneWeb are looking to provide Global Internet access, especially to the developing world. They plan to use beam steerable techniques to allow frequency reuse and clean hand off as the satellites move overhead. And at seriously fast data rates. You can read more at OneWeb satellite Internet project status update. What I found very encouraging is the degree to which Boeing, SpaceX and OneWeb are collaborating and cooperating in order to make sure that they can coexist and all provide effective services. This included adjusting planned orbital heights and frequency usage. So great to see another example of just how much Collaboration can enable opportunities, even when the collaborators look like competitors. Ignoring the play on words, the light camera is a major breakthrough in the use of multiple optical viewpoint cameras to create synthetic images that can be taken with something the size of a smart phone and rivals DSLR Camera photographs. And spoiler alert, I’m getting one as soon as I can. Read on to find out why. I enjoy photography and appreciate the balance between the size and convenience of my phone camera and the control and quality of image possible in my DSLR (Digital Single Lens Reflex) camera. Lets look at how a DSLR camera works. This image is by en:User:Cburnett – Own work with Inkscape based on Image:Slr-cross-section.png, CC BY-SA 3.0, Link. For a Film SLR camera the sensor is the film. For the DSLR Camera the sensor is a digital image sensor CCD or Charge Coupled Device. These cameras use precision ground lenses and are capable of high levels of control and image quality. They also don’t fit in your pocket unless you have a very large one. Below is a high quality rendering of a DLSR Camera provided by David McSweeney of Guru Camera. Much appreciated David. Click on the picture to get a full size version. I am very grateful to Dr Rajiv Laroia who co-founded Light. Not only has he developed a breakthrough concept in portable digital photography, but he has been very open about how he went about it and how it works. This is an excellent example of the new Collaboration landscape we now work in. He took his idea to experts to validate it rather than hiding it and hoping no-one would steal it. The last point is interesting for me. The days of monopolies are coming to an end. The days where a Brand could overcome deficiencies in an offering aren’t yet over but they are fading. Today you can source reviews from peers and industry forums and a Brand can’t as easily dominate a market just by reputation or marketing blurb. The products have to be as good as the Brand claims they are. So back to Light. Dr Rajiv Laroia has started something we will all benefit from. The concept is brilliant and the results and funding are in place to make is commercially successful. Will we see it in a smart phone soon? I can see cut down versions of this concept being deployable in the very near future. The processing power is the challenge in a low power hand held device that is also doing cellular communications. So battery life versus quick availability of the finished pictures is the trade-off right now. Is it doable in the long run? Absolutely! Here are some videos covering the development journey, the first commercial version and the use of the camera. CEDA, or the Committee for Economic Development of Australia, run regular industry sessions to discuss topics of national economic importance. The latest was a lunchtime session covering the benefits of Innovation and also some of the challenges we need to overcome to take advantage of Innovation in Australia. Here are videos of the panel discussion which raise a lot of excellent points. They are split into 2 due to their length. Below I cover my take on some of the areas covered both before and during the panel discussion. Job hunting, or seeking, is a 2 way problem. Potential employees want a good job and potential employers want good employees. Should be simple, right? Doug Blue of SEEK shared some changes in the jobs market. SEEK used to just place job advertisements on a Web site. Now they have moved to employment fulfillment with up to 70% of job placements being through their services. This is typical of the shift in value creation that is happening all over the world. A recent survey in Australia shows that 76% of people do not like their current job. Glenys Beauchamp PSM, of the Department of Industry, Innovation and Science, shared statistics and perspectives on the local economy. This is a summary of what was a very comprehensive and competent presentation. The OECD statistics show that up to 50% of new jobs are due to Innovation. So this is an important topic for national growth. And to add more weight to the argument, 60% of productivity gains are due to Innovation. Australia’s GDP growth has remained flat since 2011 and if this continues then our standard of living will start to fall. Innovative businesses grow faster, have a more diverse range of market offerings, and create more jobs in them and around them than businesses which are not Innovation focused. The Australian Government is looking at all options to improve this including funding schemes not based on grants, big science infrastructure, tax incentives, entrepreneurs programs and simplifying engagement between business and publicly funded organisations. This is a summary of the discussion. Innovation can’t just be about improving core business output, it also has to have spread and it has to be able to cross organisational and industry boundaries. One big challenge is moving to a net zero emissions while increasing energy availability. So clean energy generation is a key and Australia is well placed to be exploring that. Consumers of tomorrow will be making informed choices so those businesses that don’t educate and inform their customers will lose them to businesses that do. Many traditional businesses and industries are ripe for digital disruption. GE see software as key to their digital industrial product range. IoT, or the Internet of Things, is key to the adding of more value. Shell are looking sideways at every industry they can to identify technologies they can harness in their industry. And they find Australia has many excellent researchers and businesses that can be tapped for solutions to problems that they don’t yet have a satisfactory answer for. There is a role for Government to get the macro economic conditions right to encourage businesses to act through appropriate incentives. But Government also needs to change its own behaviour to be able to be a part of the future rather than living in a bureaucratic past. Australia was outraged that we came 10th in the medals tally at the Olympic Games yet there is no outrage about our abysmally low Collaboration and business ratings! How do we get the bigger conversation going at the citizen level? It is about investment level and investment focus. We value sporting success so we invest. To do better we have to either invest more or invest smarter. It is the same with Innovation and Collaboration. The real issue is where will the funding come from, and exactly how will it be applied. No-one seems to be addressing the lack of funding in a serious way. Intellectual Property is no longer the main game, nor is data. It is the insights you get from data that is more important. GE have made their IoT operating system, Predix, open source because it is the leverage you get from it that is valuable, not just owning it. And it could also allow others to design devices that can readily fit into the GE ecosystem. Low Collaboration is holding us back. And this is a cultural issue. So no amount of money can fix that. We have to address the culture itself. Everyone agrees a lot more money is needed and should be invested. No-one agrees to offer it. One of the key statistics about the Australian business landscape is that we are last in the world for collaboration. All sorts of collaboration. If you doubt this, just think about how much political collaboration you see here compared to overseas. The video above is a series of snippets covering why SEBN is a great idea and the value that I get from being a part of it. but number 106 for commercialisation. If you are wondering where these figures come from, they are based on statistics collected by the OECD and were among the key facts presented at Smart Manufacturing 2016. So it isn’t our innovation or problem solving that is the issue. It is commercialisation and a key part of this is collaboration which we are measurably worst at. One of the solutions is to get business leaders to actually get to know each other and learn from each other. This builds familiarity and trust and can break down the barriers we seem to naturally have here when it comes to collaboration. This is one of the key objectives of SEBN which stands for the South East Business Networks. I have been attending SEBN sessions for the past 6 years and it has helped be grow as a business leader. What is it you do to grow your ability to do business better? Successful Endeavours specialise in Electronics Design and Embedded Software Development. Ray Keefe has developed market leading electronics products in Australia for more than 30 years. This post is Copyright © 2016 Successful Endeavours Pty Ltd. 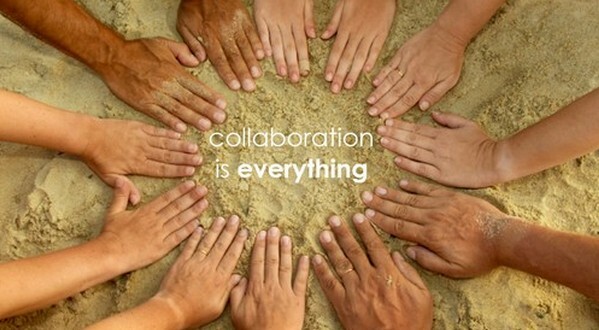 So what is Collaboration? The first thing it is not is convincing someone to work for you for nothing with the vague promise you will make it worth their while in the long run. Collaboration is working with each other to do a task and to achieve shared goals. Collaboration:Â To work together, especially in a joint intellectual effort. Collaborate:Â to work with another person or group in order to achieve or do something. Of these, the first I like best. Shared Goals is a key point for me. And it also supports the idea of each party freely bringing something to the other. Australia has the lowest rate of inter-business Collaboration in the OECD! Seriously! This is a huge problem. And we see it at every level from Federal Politics down to union engagement with enterprises through to the 3 million Small Businesses in the SME sector who are all operating in silos and not working together. I have come to the view that this is one of 2 structural problems in the Australian economy that most prevents us from being competitive. And it is a problem we can’t rely on government fixing. This needs a grass roots revolution since it is attitudes and values based. The above data was put together by Professor Goran Roos based on OECD statistical data. His role as Thinker in Residence in South Australia was to look at how to revitalise manufacturing in the state. And to solve a problem you have to first understand it. And then understand the different possible solution spaces to work in. The solution to today’s problems will require better thinking than got us into them in the first place. Albert Einstein. That is probably a paraphrase as he has expressed several versions of this same truth. But the core point, is that more of the same will get you more of the same. To get a better outcome you need better thinking. So for me it is time to think differently. This also leads to Innovation but that is another topic. The picture above shows Ray Keefe of Successful Endeavours and George Zeidan of Zeidan, Â rather like proud parents, with some examples of the internals of hardware devices already supported by the Ritri system. That is the name given to the web API back end product. You won’t be able to do much without a login so leave a comment if you want a demo. The press release for the collaboration effort is available on line at Networking in the Net. So this is our official notification that if Australia is open for Business, Successful Endeavours is open for Collaboration. Successful EndeavoursÂ specialise inÂ Electronics DesignÂ andÂ Embedded SoftwareÂ Development.Â Ray KeefeÂ has developed market leading electronics products in Australia for more than 30 years. This post is Copyright Â© 2014 Successful Endeavours Pty Ltd. Automotive Manufacturing in Australia has had a proud and vibrant history. Initially it was our distance from the rest of the world that meant we made most of the goods used in Australia right here. It wasn’t until 1965 that the creation of raw value through agriculture or manufacturing fell to below 50% of the total economy. And today those 2 sectors account for roughly 12% of the economy between them. So a 75% drop in share of GDP in just under 40 years. There are still reasons to Make Products In Australia even if some of the original reasons are no longer valid. And that is thing I wanted to highlight here. These are long term trends and need a long term perspective if we are to position ourselves to remain competitive. Whereas in Automotive Manufacturing we see a lot of short term thinking being applied. In spite of the fact that we already had the lowest rate of publicly funded support for local automotive assembly, we have just cut it further and to the point where every remaining car assembler has made the decision to exist the Australian Economy as a manufacturer. There has been a lot of rhetoric about Car Manufacturing Numbers Not Stacking Up, a post where most of the important numbers are ignored,Â or talk of the Auto Industry Is Doomed, which looks quite rightly at the innovation and disruption forces involved, but I don’t see anyone looking at how we got here. Â While it is true that workers in off shore industriesÂ can disrupt local industries by providing a cost advantage to outweigh the skills disadvantage, the better economies in the world are not showing this trend. See The Global Competitiveness Report 2013-2014. Page 11 shows where economies are positioned in terms of their stage of development and page 15 starts the ranking process. This is a trend that continues throughout the report. The USA ranks high as it should because it is both a technology leader and has the advantage of a large domestic market but many far smaller countries also rank high. among other things, all of which should hamper its competitiveness against an agile developing low labour cost nation, get to be #1? The answer is that it does not sit around waiting for developing nations to usurp its position. It has a progressive government, industry policy (they sell machine tools to Japan for instance), strong positioning and take a global view. They also understand the value chain and that integrators make more money that component suppliers. This is actually one of the strongest argument for why we should have had a more proactive approach to Car Assembly and why military build projects should still happen here. Not purely for the money in any one deal, but for the total package of benefits that ensue. So it needs an integrated approach with both Government Leadership and also Industry Collaboration. Both seem sadly lacking at present. Germany seem to know a thing or two about running a modern economy with manufacturing in the mix. They support their local car assemblers at a rate of over 4 times per head of population compared to what we were doing before we cut support. They have 4 times our population and so that is over 16 times the total value of support. They have BMW, Porsche, Volkswagon, Audi, Mercedes Benz… And we have? If you want to know what works, look at countries making it work and find out what they do. The killer has been the low production rate and the fact that we have primarily looked to service the Australian domestic market. Only Toyota have been primarily export with the Camry. If you redo the figures per car produced then we are no longer the lowest coming in a little above Germany. So we lost this battle when we decided subsidies were bad for Australia while everyone else concluded the reverse for their own economies. One of the things Car Manufacturing Numbers Not Stacking UpÂ misses is the indirect jobs that are affected. This was recently calculated at 5:1 by the Victorian Government. So we might lose nearly 60,00 jobs (6% of all manufacturing jobs) in car assembly and car part manufacturing, but there are quite a few other jobs affected and this article ignores that completely. If it really is 5:1, that is 300,000 jobs across all sectors affected. Â did I mention jobs – surely the replacement policy should come before the exit policy? I do agree with the buy Australia problem that is outlined. Australians don’t seem to value buying Australian. That being said, the offerings were out of alignment with market trends. In particular, Ford was producing a car range in large vehicles that were no longer being purchased in significant numbers. And the Toyota Corolla outsold the locally produced Camry which was a larger vehicle. The Holden Commodore is also a larger vehicle. I have no idea why we didn’t decide to make smaller vehicles here earlier! You can’t ignore a market trend for 10 years and expect to not have consequences. It is also likely that reducing car industry assistance will be an overall deficit generating move. Yes we have 3 years before that starts to bits. But it you take 300,000 jobs out of the market and don’t replace them with anything, plus the profits made and taxed by at least some of the companies in the sector, plus the personal income tax of the employed. It is likely that this is a very short term prop up to the budget for a net long term loss. The plus side is the 3 years. I don’t see the typical automotive worker moving into health care and aged care which are current growth sectors. So is there a future in Australia? I certainly think there is. And this crisis might be the stimulus we need to begin to take some steps forward on a proactive basis. There is no doubt we have some world leading industries in Australia and there is also no doubt that rising unemployment is a problem we can’t afford. For me, the biggest issue to tackle first is collaboration. You can’t have Open Innovation, industry co-operation and sustainable industry policy without it. The Japanese showed us how you could build an economy by collaborating after World War II. The USA economy looks at leverage and has much better models for inter-business collaboration. Europe is inherently more collaborative. Whatever else you might think about the European Union, only the USA and Europe have managed that level of freely entered into Collaboration. Australia has been measured as having one of the lowest levels of Collaboration in the world. This is a Reverse Salient, the thing that is holding us back. And it will be one of our focus points as a business for 2014. Â Successful EndeavoursÂ specialise inÂ Electronics DesignÂ andÂ Embedded SoftwareÂ Development.Â Ray KeefeÂ has developed market leading electronics products in Australia for nearly 30 years. This post is Copyright Â© 2014 Successful Endeavours Pty Ltd.